Depending on the zip code reported, Zillow has rated recent real estate market activity in Elk Grove from cool to very hot for the 12 months ending December, 2016. Seattle-based Zillow, an online real estate database service, issued a report this week that showed Elk Grove's three zip codes, 95624, 95757, and 95758 rated as cool, hot, and very hot respectively. Anything rated warm or higher indicates a market tilting to a sellers' advantage. Zip code 95624, which is the portion of Elk Grove east of Highway 99 is reported to have a median home value of $381,600 and is rated cool. 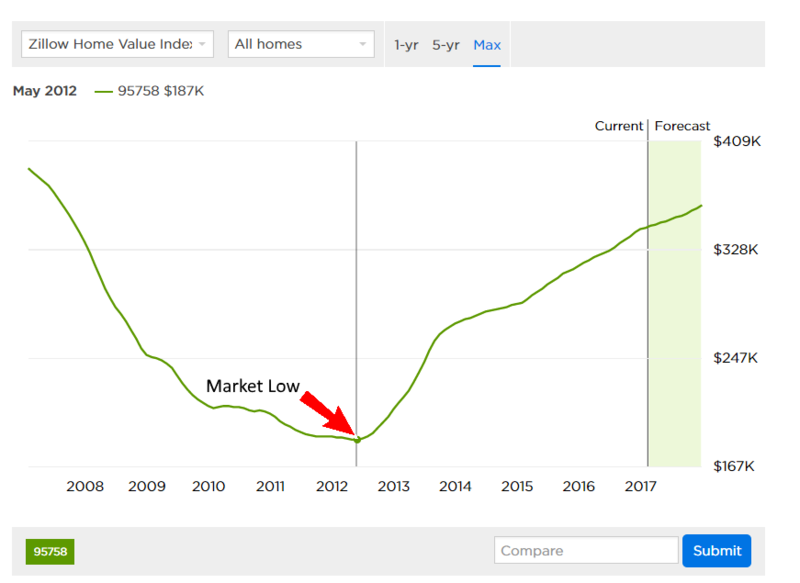 According to Zillow, home values in this area are up 6.9-percent over the last 12 months and are expected to increase 4.7-percent over the next 12 months. While the rural and older portions of Elk Grove in the 95624 zip code showed respectable gains, the two zip codes east of Highway 99 were rated more favorably for sellers. In zip code 95757, which was rated as hot, median prices were listed as $423,200 with a price growth of 6.5-percent over the last 12 months and an expected increase of 4.7-percent over the next 12 months. The City's third zip code, 95758 was rated very hot with a median price of $343,600 and with a 8.5-percent price increase in the last 12 month reporting period. Over the next 12 months housing prices in this area are expected to 5.2-percent. In all three Elk Grove zip codes housing prices have steadily increased since bottoming-out in May, 2012. However, none of the three zip codes have reached pre-Great Recession prices as reported by Zillow. Price per square foot for the three areas are $201 in 95758, $178 in 95757, and 95624 reports $188. 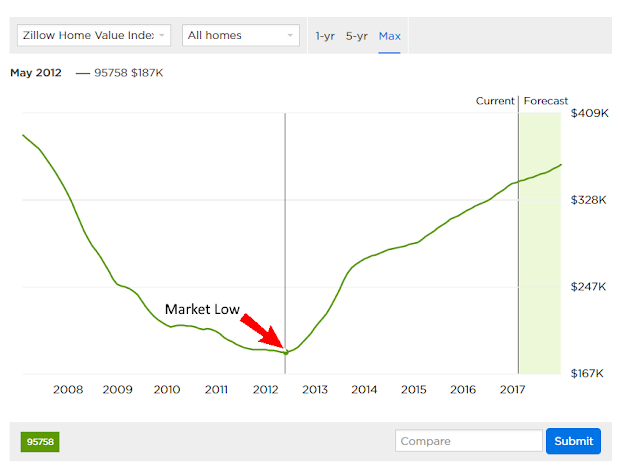 With the anticipated prices increases over the next 12 months, the value of Elk Grove real estate will still be at about 92-percent of values in December, 2006 when Zillow established its database.